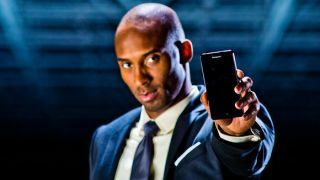 Kobe Bryant went on the Lakers' disabled list due to a painful Achilles tendon tear, but before the NBA star's season-ending injury, he was able to hawk the new Lenovo P780. The Lenovo P780 is described as "a new style smartphone" by Bryant in a behind-the-scenes almost phone-less ad. It shows the basketball player holding the China-bound device at the very end. The one-minute video doesn't get into the official Lenovo P780 specs either, but the it will have a 5-inch display, 8MP camera, and 4,000 mAh battery, according to Engadget and GizChina. That should make for Bryant-style battery stamina at full health. The WCDMA device is also said to be 9.9mm thick and boast a sensitive touch screen that allows gloves and non-capacitive styluses to be used. The Lenovo P780's battery life and camera solution are have certainly been upgraded over the P770 model. Last year's Android smartphone by the Chinese company had a smaller 3,500mAh battery, a 5MP camera, and a dual-core 1.2 GHz Cortex-A9. There's no official word on the P780 CPU, but in all likelihood it will have a quad-core MediaTek chipset and 1GB of RAM, according to the latest rumors. Lenovo is said to be launching the new smartphone in China later this month, but the Beijing company hasn't announced plans to release this dual-SIM device outside of its home territory. Bryant may be one of the few Americans to play around with the Lenovo P780 if that remains the case.